Loyalist intimidation has reached shocking new levels after sectarian graffiti appeared in south Belfast that threatens to ‘crucify’ Catholics, while Nazi flags were erected near a loyalist bonfire site in County Antrim. A chilling image of a masked gang with baseball bats and cudgels beside graffiti which reads ‘Taigs [Catholics] will be Crucified’ appeared on social media on Monday afternoon, signed ‘VTOT’. ‘VTOT’ stands for Village Team On Tour, a loyalist murder gang based in South Belfast. A large wooden cross later appeared placed beside graffiti warning that “Taigs will be dealt with”. The 8ft cross has appeared on Donegall Road, not far from the ‘crucify’ threat. Sinn Fein’s Fra McCann has called for the PSNI to investigate the graffiti and the picture as a sectarian hate crime. Meanwhile, a variety of Nazi flags were attached to lampposts by loyalists in Carrickfergus on Tuesday, alongside the US Confederate flag, British Union Jacks, loyalist paramilitary flags, and what appeared to be an Israeli ‘Star of David’ flag. One of the flags with a skull at its centre is believed to have been an attempt to intimidate Polish nationals, as the flag once represented Nazi forces in Poland. 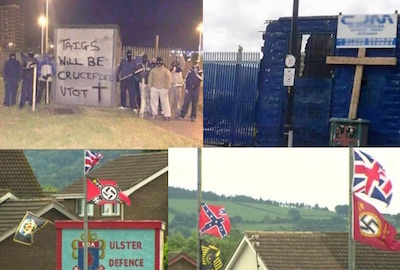 The banners, which also feature swastikas and SS emblems, appeared at a bonfire site at the loyalist Glenfield estate in the County Antrim town. However, after images of the Nazi flags on social media provoked condemnations by British Army veterans, they were removed. By Wednesday, loyalist representatives said the Confederate flag had also been removed. Last week, loyalists made headlines when they hoisted a US Confederate flag outside the home of a black family in east Belfast. Local Alliance Party representative Stewart Dickson, who was one of the first to criticise the flags on Tuesday evening, said he had subsequently been threatened in graffiti in the town. “I will always speak up for what is right,” he said. East Antrim Sinn Fein assembly member Oliver McMullan said all offensive flags should be removed, including the loyalist paramilitary flags which continue to fly in several areas across the North. “It seems that unionist public representatives are unwilling to challenge the erection of flags celebrating and promoting loyalist murder gangs,” he said. The appearance of loyalist paramilitary flags in nationalist areas of south Down has raised tensions in that area. The Republican Network for Unity urge residents of Killyleagh to remain vigilant after the insignias were erected by masked paramilitaries outside the Catholic church and near by nationalist areas of the village. The PSNI told residents they would take no action unless the flags were “likely to cause a breach of the peace”, said RNU South Down spokesperson Cathy Murray. “It is our belief that somewhere down the line this partisan political police force will have to be held accountable for their deliberate appeasement of loyalist paramilitarism which is leaving nationalists isolated and vulnerable to what amounts to state sponsored intimidation and possible attack,” she said.